By applying watercolor paint on top of a gel enhancement, Kari McQuitty creates a layered effect, making her designs really stand out. 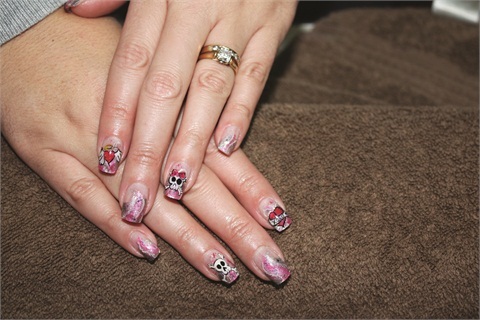 Kari McQuitty is an Amoré certified educator and talented nail artist from Strathmore, Alberta, Canada. She owns the beauty school All About Nails and Training, where she offers beginner and advanced courses for nail enhancements and nail art. 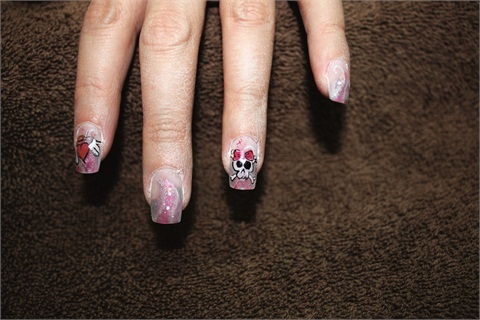 By applying watercolor paint on top of a gel enhancement, she creates a layered effect, making her designs really stand out. 1. Prep and apply Amoré Ultima bonder. Cure for 20 seconds. 2. Brush Silver Fairy Dust pigment right onto the bonding dispersion layer. Then apply Hot Pink pigment and blend it using the Light Pink. Finish off the other areas of the nail with more Silver Fairy Dust. Cure for 20 seconds. 3. Use Silver Lining Pixie and Primary White from Amoré Ultima. Apply Silver Lining with a thin art brush. Then, streak Primary White through the Silver Lining Pixie gel. By pulling the Primary White through the gel, you will create a fine line of white for a smoky look on the nail. Cure for 20 seconds. When you have added the Silver Lining and Primary White to all of the nails, encase the nails in Sculpt and Shine and fully cure for two minutes. 4. Shape and buff the nails. It is important to buff the nail smooth to create the right surface to paint on. 5. Using watercolor paints, load your #00 brush with the color of your choice and create the bottom layer of your design. 6. Outline in black watercolor using either your #00 or your #1 art brush. 7. Add very simple highlights with some white watercolor paint to each design. When working on nails, remember less is more. Try to keep all your painting down to three steps and see what you can create. It is important to let the watercolor paints fully dry before applying any top gloss. If your art is not dry it will bleed and be lost within days. Apply top gloss and cure for two minutes and see your creation come to life. Fairy Dust is a 100% pure mineral pigment sold at All About Nails and Training.